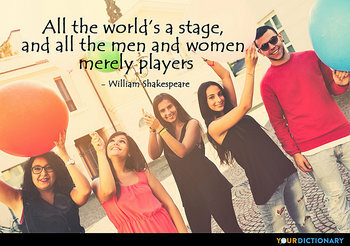  William Shakespeare, As You Like It (c.1599-1600), Act II, scene 7, line 139. I have a little black book with two players in it, and if Iget a chanceto dothem Iwill.Iwill makethemsuffer before I pack this game in. If I can kick them four years over the touch-line, I will.  1970 Remark to reporters, which led to severe trouble with the soccer authorities. Quoted in Colin Jarman The Guinness Dictionary of Sports Quotations (1990). It was an ideal day for footballtoo cold for the spectators and too cold for the players.  1963 Reporting on a match between the Chicago Bears and the NewYork Giants. The fans are starting to get disgruntled with the board, with the players.  Phil deflects from himself after another sorry defeat at Colchester. It was a fantastic result and credit has to go to the players. The application they have shown since I got the job has been first class. They've just asked for four or five days off this week, but I've said I want them back in on Tuesday.  When the players ask for a holiday, that shows their hard-working attitude! In players, vanity cripples art at every step. There are certain guys that are band players and there's certain guys that ain't. If there's anybody lazier than me, it's Eric (Clapton). There are many star players in Italy, but the only one I would bring to Bayern Munich would be Totti. I know him well and he deserves to win the Ballon d'Or.  Conrad Russell, 5th Earl Russell, as quoted in The Spectator (11 January 1997). Volleyball is not like a formula so we must give players some freedom.